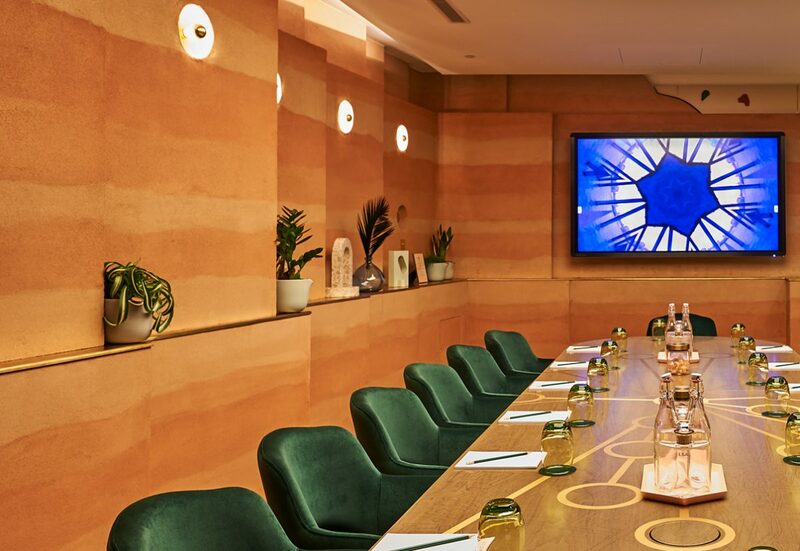 Flagship design hotel, Hilton London Bankside, has partnered with Bompas & Parr – experts in multi-sensory design – to launch The Agora, the world’s best meeting room packed with features specifically designed to stimulate creativity. The interior design features a Clayworks Rammed Earth Aesthetic, a natural clay plaster finish that has been developed by our team in Cornwall to represent the beauty of rammed earth building techniques and that can be used where the real thing is not practical. From flooding the room with scented air at the push of a button to specially curated objects designed to increase productivity, mood-improving lighting installations and refreshments designed to recharge physiologically, every detail is based on the science and psychology of fruitful human interactions and innovation. Taking inspiration from its eclectic location, the creativity-enhancing room can be found within the design-hotel, Hilton London Bankside, located in the cultural and vibrant neighbourhood of Bankside, nestled between London Bridge and Blackfriars. The Agora name was inspired by its translation to ‘gathering place’ in ancient Greece and was also known to be the centre of artistic and creative trading in Athens. Silent moments in brainstorms could be no more in The Agora – an emergency creativity button has been installed and once pressed, a jet will push out cool air to wake the individual up and stimulate imagination. The cool air will also be scented with flavours such as lemon oil (stimulating signals in the brain), peppermint (invigorating the mind) and cinnamon (research shows this enhances creativity). The latest in interactive screen technology will be available to guests that book the Agora – a 75-inch screen allows seamless, wireless connection and communication with guests’ own devices, ending the misery of connection difficulties often experienced in meeting rooms. Activate the Blue Moods light setting on the control panel to initiate a bespoke piece of immersive video art designed to make guests feel more alert and open to creative solutions. Artist Doug Foster’s hypnotic creation, featuring hints of Hilton London Bankside and its surrounding architecture, offers five-minute mind breaks and engulfs the room in a blue hue scientifically proven to arouse the sub-cortical area in your brain. The room also features a sculptural wall with in-built displays for artwork and objects designed to inspire. Objects include plants which are known to boost productivity and art from local artist, Will Yates Johnson. Creativity tea station with illuminated shelves and a specially curated tea menu including brain-boosting ingredients such as bee pollen (containing amino acids to increase dopamine and serotonin levels), ginkgo (to increase blood circulation in the brain), kelp (which contains folic acid to improve memory) and brahmi (which helps regulate the balance of the mind). A wall designed for guests to pin creative outputs up directly using magnetic terrazzo style pieces. The wall can also be used as a whiteboard to jot down notes mid-brainstorm or doodles which are also known to increase attention and memory. Our relationship with Bompas & Parr has enabled us to create a world first, a truly inspiring meeting room where every key detail has been put in place to result in boosted creativity and inspiration. We were already proud of our award-winning meeting room space and facilities on offer but the new Agora room gives us the edge by providing a unique opportunity for creative minds, corporates and professionals to come together and enjoy a room fully serviced for inspiration. Most meeting rooms are bland and uninspiring – and creativity needs a helping hand. At Bompas & Parr our chaotic studio is full of unusual and interesting sight, sounds and smells so we already had a sense of the psychological value of the role the environment that surrounds you plays in idea generation. Now we understand more about the underlying science of creativity and have deployed this strategically for Hilton London Bankside. It was also a nice surprise to discover the importance of Bankside in the capital’s creative contribution as we designed the perfect creative space. Hilton London Bankside is a flagship London design hotel and pioneer for the next generation of Hilton hotels. Located in the heart of the vibrant cultural quarter of Bankside, the hotel features a contemporary industrial design and artworks by British artists referencing the rich history of the Bankside area and its past life as an Essence Factory in the 1800s. Reprinted with the kind permission of Hilton London Bankside.